In order to do spiritual travel, the soul or consciousness of the traveler must temporarily leave the physical body. This usually means shutting off all physical sensations and entering completely into an inner environment. There are three basic ways of doing this. The most dramatic method of leaving the body is to go directly from a waking state into the inner world. This usually happens during meditation but may happen spontaneously while relaxing, such as while lying in bed. 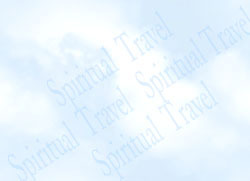 By far the most common method of spiritual travel occurs when the traveler "wakes up" in a dream. The sense of waking up brings with it a kind of excitement which is accompanied by a feeling of increased awareness, self determination, and concentration. It is also usually accompanied by a wonderful sense of freedom and possibility. The traveler feels himself to be free of the limitations of the physical body. An unusual form of spiritual travel involves the ability of shift back and forth between the outer world of the senses, and a separate inner reality. Doing this at sufficient speed makes the spiritual traveler capable of being in touch with two separate realities, or seemingly in two places at once- thus the term bilocation. To control this ability requires a great deal of skill, and such control usually only occurs in advanced practitioners.